The café is not overpriced like you might expect, being that it is in such a niche business market. Surprisingly the place has been filled or nearly filled every time I’ve been there, and each time it was a completely affordable outing. 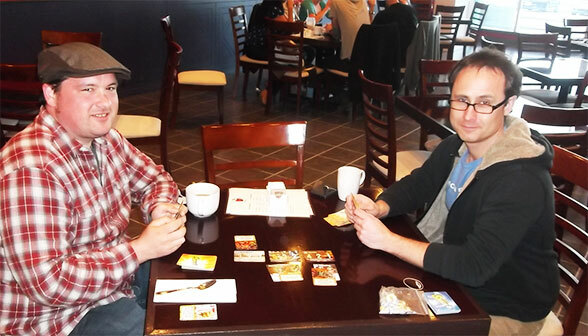 As a fee for the board game services, participants are asked for a $5.00 cover charge and after that all the prices of snacks, coffee or other beverages are pretty standard as far as coffee shops go. I paid $2.00 for a large coffee and also had a blue lemonade Jones Soda. A nice treat would be the shakes and smoothies, both priced at $4.50. Because it goes perfectly with board games, the café offers party mix (which is actually just a bowl of Ringolos, tortilla chips, corn chips and cheesies) or a bowl of the increasingly popular veggie straws. 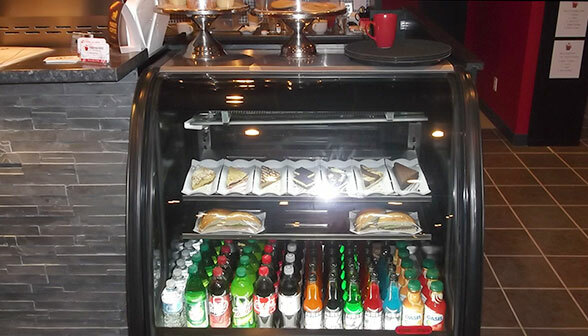 Aside from the snacks, the food options are slightly limited, serving only pre-made sandwiches. They do have a nice variety of sweet squares, tarts and cakes to hit your sweet spot. 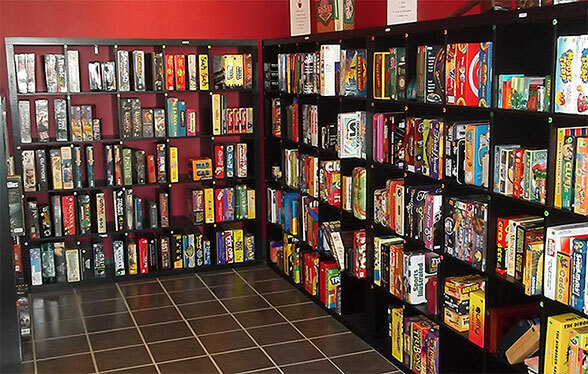 For the most part, a seemingly regular bunch of patrons are coming to Pair-A-Dice, bringing newcomers more and more are there for the vast selection of board games. But patrons go for the games. They have a broad selection of classics like Monopoly, The Game of Life, Battleships, Jenga or Clue. Titles like this could never be wrong. I’d like to bring a larger party and play a long game of Risk at least once. Heck, I’ve already made plans to go back next week. But the café also features more esoteric games, or slightly off-the-radar types of games that aren’t too difficult and are often more enjoyable. A popular game now-a-days (even played on the sitcom Big Bang Theory) is Settlers of Catan. Pair-A-Dice has it as well as a number of its Expansion sets. One of my favourites is a more complex game called Power Grid. And the last time I visited, one of the friendly waiter taught me and a friend how to play a crazy, awesome card game called Smash Up. I’m glad I tried it. It was so fun that we ended up playing for a 3 hour run. I’m just thinking ahead to the winter time when it’s much better to be indoors than out in some blizzard. Pair-A-Dice is going to be an excellent winter getaway. It would be perfect after a hockey game, or after hitting the slopes; just an exciting game and a hot chocolate. Or even for an entire day of games on the weekend. You won’t end up spending too much money, and the fun will surely be through the roof (as they say). The hours of the café at 12PM – 12AM, so you can surely get gaming there pretty late too. Now that the South End of Barrie has become a bit of a recent retail hotspot, the location at 31 Commerce Park Drive has a variety of benefits. It’s literally a 3-minute walk from the Wal-Mart parking lot and there’s a lot of parking space right at the café door.